Since we’re using the same REST API for all subsidiaries and the front-end logic should generally be the same, we don’t want to create three separate Angular projects, since that would be a lot of code duplication. Code sharing with multiple apps in the same project isn’t really top of mind in Angular. .angular-cli.json supports the definition of multiple apps as described by stories multiple apps, but the Angular CLI still assumes one app named app, when generating a new component for example. By the way, I’m using Angular 5.0.1 at the time of writing this. For services, pipes and plain classes code sharing isn’t a problem since they can be defined at the project level and referenced in the respective app modules, but the component logic is still bound to the component and we need to have different components to have different HTML and CSS for the different apps. By creating base components at the project level that aren’t rendered directly and don’t have any mark-up or styling, we can create child components in the respective subsidiary apps that extend a base component and defines the template and CSS. The base component contains all the logic and the corresponding spec file defines all the tests for the component and is therefore also shared code. 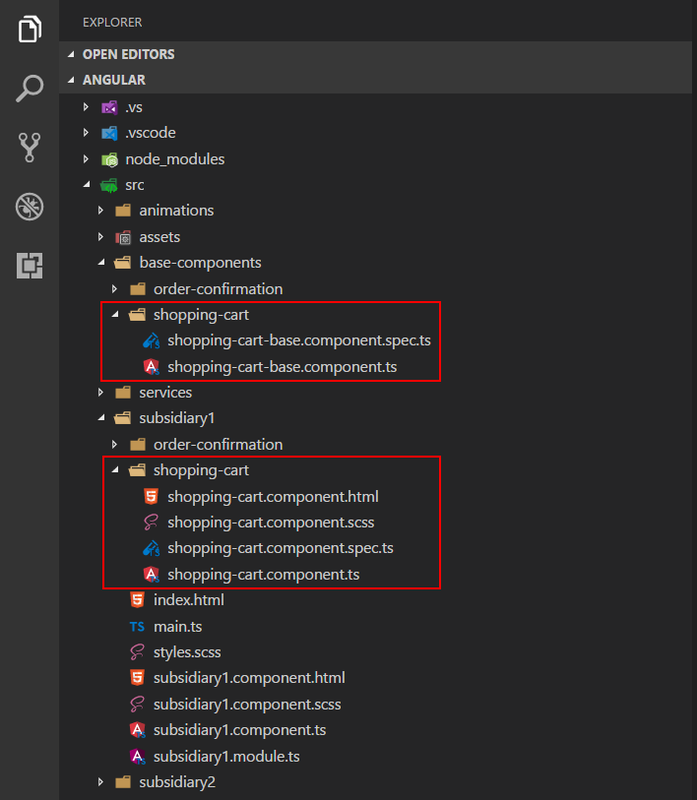 The child component implemented by each subsidiary company (app), has an empty implementation and a single test case that only tests if the component can be created (what you get automatically when creating a component with Angular CLI). If there is a need to have diverging logic as well, we can easily override the base component’s property or method by simply defining it in the child component. Or if we want some additional logic in only one of the apps, that’s just as easy by adding it to that app’s child component. The best of both worlds!